Mikhail Safarbekovich Gutseriev (born 9 March 1958) is a Russian entrepreneur, businessman and poet. 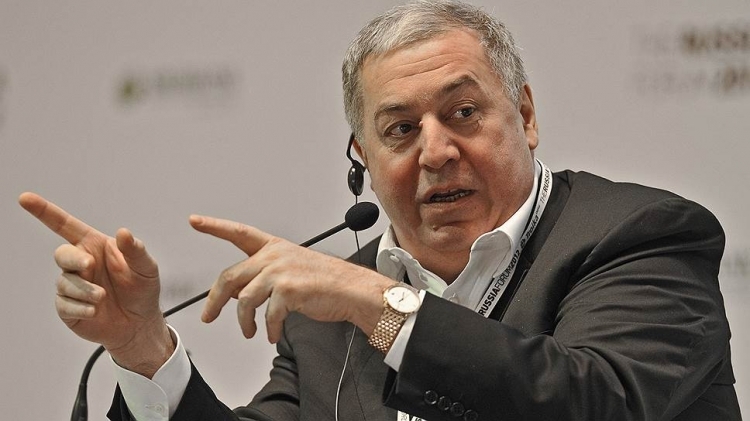 He is the owner of "Russneft", NK "Neftisa", OAO "Russian Coal", ZAO "Mospromstroy" and also GCM Global Energy, a British company, with annual revenue of $1 billion controlling large oil assets in Kazakhstan and Azerbaijan. Gutseriev also owns large assets in real estate including the "National" Hotel and luxury shopping centres such as Petrovskiy, Smolenskiy and Novinskiy Passage. In 2012. Gutseriev began to invest into the media business, and has acquired seven radio stations thus far. According to Forbes, Gutseriev has a personal fortune of $6.2 billion as of March 2016, up from $2.4 billion the previous year. In late 2006 he was accused of violating terms of his oil license and failing to pay taxes. After denying the charges, he sold Russneft to billionaire Oleg Deripaska for $2.8 billion and moved to London. When the charges were dropped in 2010, Gutseriev returned to Russia and bought back Russneft. Gutseriev writes lyrics for songs performed by famous Russian singers. The Afipsky Oil Refinery Vladimir Kogan headed the ex-general director of the Krasnodar Oil Refinery, which is part of the Safmar group of Mikhail Gutseriev. Gutseriev - at the final stage of negotiations on the purchase of the plant. Such is the fee for an unsuccessful hedge against falling oil prices - raw materials are becoming more expensive. Valentin Gapontsev and his son Denis with a capital of 3.14 billion dollars were among the ten richest families in Russia. FAS will approve the sale of the Russian unit of the German network to the group "Safmar" in the near future. The group "Safmar" purchased for 18.5 million pounds office building in London's West End, which houses the headquarters of Zodiak Media. Experts believe that the deal turned out to be beneficial for the Gutseriev family. EAST Group Alexander Nesis created one of the world's largest freight car manufacturers - the United Railcar Company, but retained only a minority stake in it. After the collapse of the "Moscow banking ring", the shareholders of the HVAC stopped understanding each other. After buying Media Markt, the group "Safmar" Mikhail Gutseriev controls almost 30% of the domestic market of consumer electronics and household appliances. Now the group has to live up to its expectations for capitalization growth, focusing on improving efficiency, increasing profitability and developing the online sales channel. The co-owner of the ruined "Binbank" continues to seize retailers of household appliances and electronics in Russia. The goal is to create a mega-collective farm in the retail market, which will then be sold to Russian state-owned banks. For Russian consumers, this means the end of the era of competitive prices. On the eve of the second wave of the banking crisis, the Central Bank intends to prohibit owners of sanitized banks from traveling outside the Russian Federation. Their assets will also be blocked for the duration of the proceedings. For large oligarchic banks, already sanitized by the Bank of Russia, an exception has been made. A year after the introduction of anti-Russian sanctions, Metro Group's revenue in Russia fell by 14% (to 3.6 billion euros). In the first half of the current fiscal year, sales decreased from 1.8 to 1.5 billion euros. The group "Safmar" of the Gutseriev family is ready to purchase "Media Markt" stores in Russia. Mikhail Gutseriev found and sold "Eldorado"
The businessman bought the network for 33 billion rubles, and now sells it for his own "M. Video" for 45 billion rubles. The networks of household appliances and electronics "M.Video" and "Eldorado", which are part of the "Safmar" group of Mikhail Gutseriev, are united. Promsvyaz Capital bought shares from NPFs and immediately sold them to the bank itself. In the banks "Opening" and Binbank burned up to 50 billion rubles of retirement savings. The Bank of Russia suddenly became concerned about the creation of a mechanism for the recovery of independent pension funds. Experts cynically suggest that there is no money there. The head of Russia's richest family has been a frequent guest in Belarus and of the president of the country since 2000. Its transfer to the Banking Sector Consolidation Fund can be announced in the coming days. A financial bubble named after Gutseriev-Shishkhanov is ready to burst at any moment. The business empire of Mikhail Gutseriev and his nephew, Mikhail Shishkhanov, is bursting at the seams. The main problem, the debt burden, cannot be solved. Mikhail Gutseriev talks about seven years of business revival, praises the Central Bank and Elvira Nabiullina and cites his own poems. Probably the new owners of the trading network urgently needed to return a bank loan. While the NBU is thinking over permission to sell Ukrainian Sberbank to a consortium of investors represented by Said Gutseriev and Norvic Bank, another buyer, Viktor Prokopenya, emerged.